Rare Earth Neodymium Magnet - Coated to reduce corrosion and provide a smooth finish. Powerful Magnet designed for DIY projects, science experiments, tool holder, pickup tool, or mounting utility. 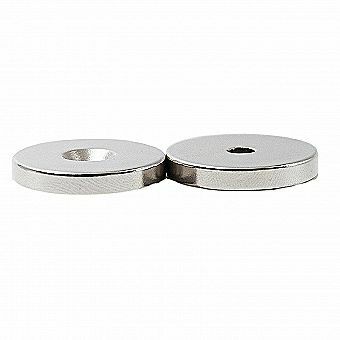 Rare Earth Neodymium Magnet 2pc Set Utility/Tool Holder Magnets Round 1.26in / 32mm Diameter Very Strong NdFeB Magnetic Cup Disc with Screw Mounting Hole Always be safe handling powerful magnets such as these. Magnets can snap together and break if not properly handled.